I'm at Gamestop yesterday getting a game for my wife and they had a sheet of release dates on the counter. 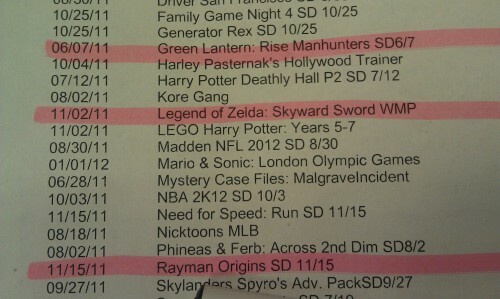 Conveniently it was opened to the page with The Legend of Zelda: Skyward Sword and a release date of 11/02/2011. Of course I had to ask if this was a Gamestop estimated date or an actual release date, with the answer being an actual release date. The employee even went as far to show me what the date would have been in Gamestop estimated it. So there you have it. We should be able to expect the most recent version of Zelda out for this holiday season, but what else does that mean? Well unless Nintendo is doing a record release time for an announcement of a new gaming console, this game will not be on the Project Cafe system. It also means that Nintendo actually has something worth buying this holiday season. WOOHOO!